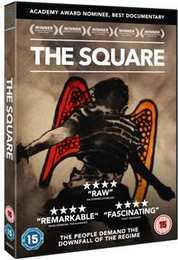 Fans of recent history documentaries will be thrilled to see that Kaleidoscope Home Entertainment have announced the 14th July release of The Square on DVD. Looking at the stories behind the headlines of the Egyptian revolution, this has a runtime of 104 minutes, comes with a 15 certificate, and a recommended retial price of £17.99. This details the incredible sacrifices made by a group of Egyptian activists as they battle regimes and risk their lives during the revolution, giving us a personal view of the conflict from the ground since the country’s overthrow of a 30 year dictatorship in 2011. The Egyptian Revolution has been an ongoing roller coaster. Through the news, we only get a glimpse of the bloodiest battle, an election, or a million man march. At the beginning of August 2013, we witnessed the second president deposed within the space of three years. This is a truly immersive experience, transporting the viewer deeply into the intense emotional drama and personal stories behind the news. It is the inspirational story of young people claiming their rights, struggling through multiple forces: from a brutal army dictatorship willing to crush protesters with military tanks, to corrupt a Muslim Brotherhood using mosques to manipulate voters.